Okano Cable to Begin Selling Ultra-thin Optical Fiber Cable｜2018｜News Release｜Furukawa Electric Co., Ltd.
Okano Cable Co., Ltd. (Headquarters: 1-5-28 Fukami-Nishi Yamato-Shi Kanagawa; President: Masaru Seto), a member of the Furukawa Electric Group, will begin selling Ultra-thin Robo Vauer—a thinner, lighter, and more compact version of the Robo Vauer optical fiber cable that withstands repeated bending—in February of this year. Optical fiber cable that uses quartz glass usually exhibits immediate optical loss after bending, and this can lead to long-term issues with reliability and durability. However, this issue was resolved with the release of Robo Vauer in December 2013. Ultra-thin Robo Vauer was developed in response to feedback from customers who were using Robo Vauer and encountering difficulty dealing with excess cord branches when wiring in narrow and small areas. 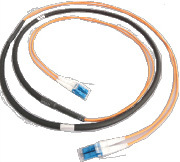 The new cable is improved with a uniboot type connection between the duplex LC (DLC connectors and the φ2.8 mm outer diameter cord. This ultra-thin cable offers the same bending performance as Robo Vauer, and has passed a 100 million plus times left/right bending test and a 40 million plus times U-sliding test (still under testing). It is the ideal cable for mobile wiring applications including industrial robotics, mounter transmission equipment, medical equipment, and machine vision, that require high reliability and environmental resistance properties (such as oil, heat, and flame resistance). (Note) Bending characteristics are based on internal testing requirements, and are not guaranteed product values.